The heated oxygen sensor 2 has a much longer switching time between rich and lean than the air fuel ratio (A/F) sensor 1. The oxygen storage capacity of the three way catalyst 1 causes the longer switching time. To judge the malfunctions of heated oxygen sensor 2, ECM monitors whether the switching response of the sensor's voltage is faster than specified during various driving conditions such as fuel cut. P0139 HO2S2 (B1) (O2 sensor circuit slow response bank 1 sensor 2) The switching time between rich and lean of a heated oxygen sensor 2 signal delays more than the specified time computed by ECM. Do you have CONSULT? Do you have CONSULT? YES >> GO TO 2. For better results, perform вЂњDTC WORK SUPPORTвЂќ at a temperature of 0 to 30В°C (32 to 86В°F). Start engine and warm it up to the normal operating temperature. Start engine and keep the engine speed between 3,500 and 4,000 rpm for at least 1 minute under no load. Let engine idle for 1 minute. Make sure that вЂњCOOLANT TEMP/SвЂќ indicates more than 70В°C (158В°F). If not, warm up engine and go to next step when вЂњCOOLANT TEMP/SвЂќ indication reaches to 70В°C (158В°F). Select вЂњHO2S2 (B1) P0139вЂќ in вЂњDTC WORK SUPPORTвЂќ mode of вЂњENGINEвЂќ using CONSULT. Start engine and follow the instruction of CONSULT display. It will take at most 10 minutes until вЂњCOMPLETEDвЂќ is displayed. Is вЂњCOMPLETEDвЂќ displayed on CONSULT screen? YES >> GO TO 5. Turn ignition switch OFF and leave the vehicle in a cool place (soak the vehicle). Perform DTC confirmation procedure again. Is DTC вЂњP0139вЂќ detected? YES >> Proceed to EC-234, "Diagnosis Procedure". Perform component function check. Refer to EC-233, "Component Function Check". Use component function check to check the overall function of the heated oxygen sensor 2 circuit. During this check, a 1st trip DTC might not be confirmed. NO >> Proceed to EC-234, "Diagnosis Procedure". Check the voltage between ECM harness connector and ground as per the following condition. Clear the mixture ratio self-learning value. Refer to EC-142, "Work Procedure". Run engine for at least 10 minutes at idle speed. Is the 1st trip DTC P0171 or P0172 detected? Is it difficult to start engine? YES >> вЂў Perform trouble diagnosis for DTC P0171. Refer to EC-246, "DTC Logic". вЂў Perform trouble diagnosis for DTC P0172. Refer to EC-250, "DTC Logic". Disconnect heated oxygen sensor 2 harness connector. Check the continuity between HO2S2 harness connector and ECM harness connector. Check the continuity between HO2S2 harness connector and ground, or ECM harness connector and ground. Check the heated oxygen sensor 2. 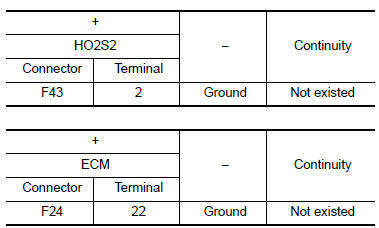 Refer to EC-235, "Component Inspection (HO2S2)". NO >> Replace heated oxygen sensor 2. Refer to EX-5, "Exploded View". Turn ignition switch ON and select вЂњDATA MONITORвЂќ mode of вЂњENGINEвЂќ using CONSULT. Select вЂњFUEL INJECTIONвЂќ in вЂњACTIVE TESTвЂќ mode of вЂњENGINEвЂќ using CONSULT, and select вЂњHO2S2 (B1)вЂќ as the monitor item with CONSULT. Check вЂњHO2S2 (B1)вЂќ at idle speed when adjusting вЂњFUEL INJECTIONвЂќ to В± 25%. вЂњHO2S2 (B1)вЂќ should be above 0.72 V at least once when the вЂњFUEL INJECTIONвЂќ is + 25%. вЂњHO2S2 (B1)вЂќ should be below 0.18 V at least once when the вЂњFUEL INJECTIONвЂќ is − 25%.